Well, we are fighting off the colds here at our home. So yucky to be hacking away with a dry raspy cough, you know, the kind that makes your head & chest hurt?! So far, just D & I have it - hoping the other two members of our family don't get it! 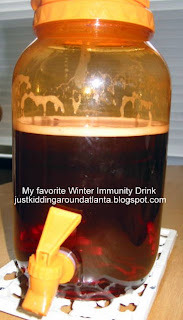 I made a most delicious, vitamin infused drink for us to fight this off and wanted to share it with you - both kids LOVED it! And it is super easy to make - only 3 ingredients! Sorry, I didn't remember to take pictures before I made this!! 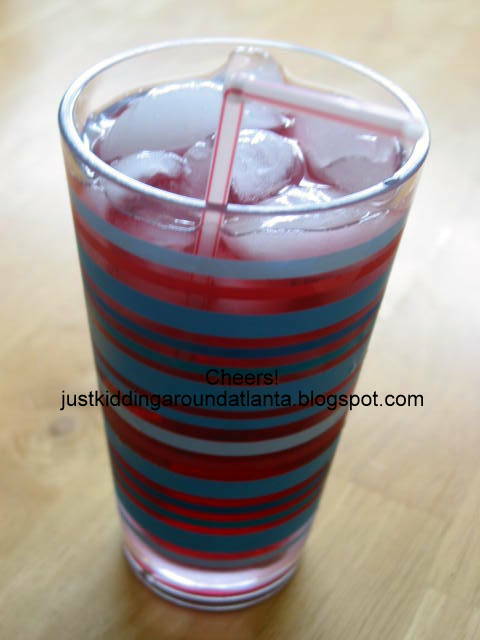 We love cranberry juice with Lime La Croix water, so I wanted something similar. 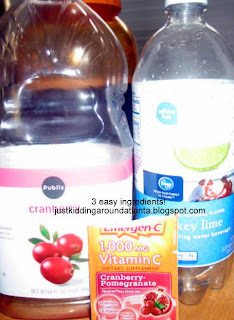 I used one bottle of cranberry juice cocktail ( you can also use pure cranberry juice), one small bottle of fizzy sugar-free key lime flavored water, and an envelope of Emergen-C cranberry pomegranate drink mix. I used a large plastic drink dispenser, and just shook it all up! Then store it in fridge and let it get cold! The water and Emergen-C will both make this drink fizzy (which makes it a little like soda - more tempting for kids!) That is why you see the bubbly/frothy stuff on the dispenser. It is really, really tasty! And loads of vitamin C! So if you've got colds or other bugs going around your house, give this drink a try! Hope you love it like we did ~ yummmmm!